Rather than tossing players into a constantly-moving explosion festival, Bioshock Infinite will allow players to explore and choose exactly when they move forward. Pacing is an important consideration when telling any sort of story, and a number of games over the past few years have used frequent action pieces and well-placed explosions to make the player feel like they're in the center of an action movie. While this approach has worked well for games like Uncharted 2, a few fans expressed concern after watching the heavily-scripted trailer released for Bioshock Infinite last week. However, in an interview posted today, the game's creators insisted that players will be able to set their own pace as they explore Infinite's floating dystopia. During the interview, Shaun Robertson - the lead artist on the game - stated, "No, it's definitely not going to be one giant action sequence." He added that the recent ten-minute gameplay video, designed to introduce viewers to the protagonist - Booker DeWitt - and the flying city of Columbia, merely had "some demo-ey things in there that help progress the action." While the game will have a few action events to propel the plot forward, playing Infinite is not going to be like "watching a movie and going from big moment to big moment to big moment." Instead, the player will be in charge of deciding when the plot should move forward. According to Robertson, "It's very important to us that the player has time to explore. For those who enjoy the environment, they can explore and take as long as they want. For those who just want to blow through it and get the story done, well they can avoid all the exploration areas and just plough through the story as quick as they can." These sentiments should be welcome news to players fascinated by Bioshock Infinite's floating dystopia. I think that having the freedom to explore each of Columbia's crumbling hallways before moving on to the next area will make the plot all the more captivating. 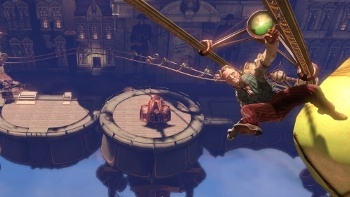 Bioshock Infinite is currently slated for release at some point in 2012.